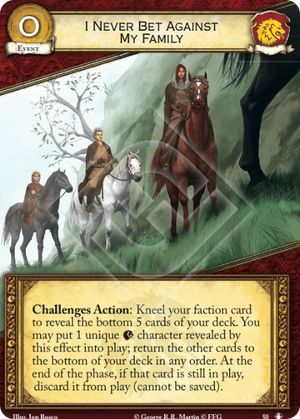 Challenges Action: Kneel your faction card to reveal the bottom 5 cards of your deck. You may put 1 unique character revealed by this effect into play; return the other cards to the bottom of your deck in any order. At the end of the phase, if that card is still in play, discard it from play (cannot be saved). “At the end of the phase” Delayed effects initiate (and resolve) in an order decided by the first player - regardless of the order the effects that created them were played. In the case of I Never Bet Against My Family and Tears of Lys, the FP will decide whether that Unique Lannister winds up in the dead pile, or the discard pile. ​After this, reactions to the phase ending (or to that poor, poisoned character dying) proceed in the usual order. I Never Bet Against My Family can NOT bring into play a unique character that is already in that player's dead pile. If you bring a duplicate into play (say you find Tyrion when you already have Tyrion in play), the duplicate ("that card") will be discarded at the end of the phase, if it is still in play.